Admittedly, I’m the glutton of the group. I’m the one who’s always looking for a delicious GF dessert, snack, or other sweet treat. I like salads and veggies and meats and fruits, and I need to be more dutiful about honing my cooking skills, but when I NEED something, I usually need something sweet. Or rich. Or decadent. I might have a bit of a problem. Back to my $24. In my latest round of Costco coupons, I saw one that said $9 off Cuisinart automatic ice cream maker. Hmmm. I told myself if it was less than $50, I would definitely buy it for my husband who has mentioned on several occasions that we should get one. I rolled my eyes. Said we’d never use it. Said we didn’t have room for another appliance. That part is true, but let me tell you, we are going to use this baby. 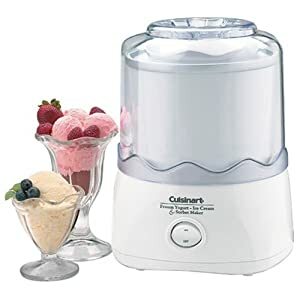 I was pleasantly surprised to find that this automatic ice cream maker—no salt, no ice—was twenty-four bucks. It came home with me. Go to Costco and buy the nifty ice cream maker. Bring it home. Wash it. Put the bowl in the freezer. Whisk together 2 cups of dark chocolate almond milk, 1 cup of original almond milk, and 3/4 cup of organic cane sugar. Whisk for about two minutes. Stir in two teaspoons of pure vanilla. Get your frozen bowl out of the freezer and put the three easy parts of the machine together. Set timer for 25 to 30 minutes. Voila! I was able to sneak in about a serving or two for myself. Pure deliciousness. Watch out for the ice cream headache and enjoy!! Stay tuned for my GF banana oat muffins. If you didn’t know they were GF, you wouldn’t know they were GF. And don’t tell Dr. Jana. I’m supposed to be on phase one. And someone please take the rest of the dark chocolate covered espresso beans by the coffee station at work before I take the rest of them and put them in ice cream. This entry was posted in gluten-free and tagged affordable, gluten-free dessert, gluten-free treats, ice cream, summer, sweets by kenzihoward. Bookmark the permalink. I am SO going to buy this! I’ve been wanting to try making some ice cream made with coconut milk which is so yummy and so good for you. Any ANYTHING made by Cuisinart is a good machine. I know! I was expecting it to be more, so I was really thrilled at what a great deal it was.